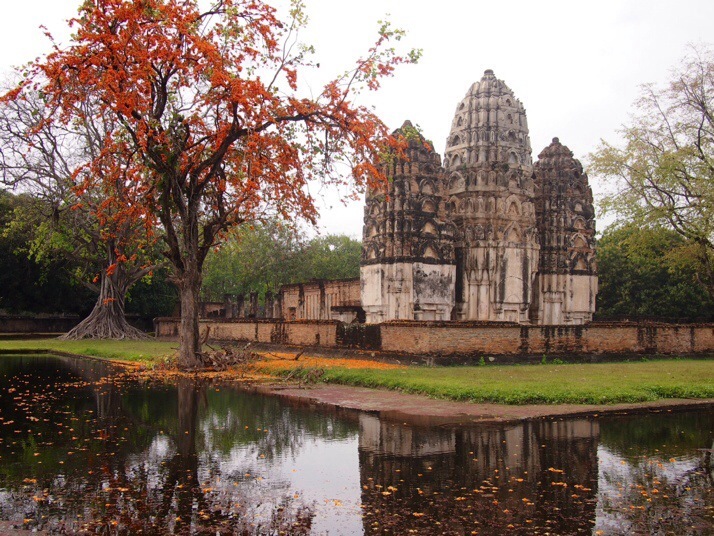 The Historic Town of Sukhothai and Associated Historic Towns is a UNESCO World Heritage site which consists of Sukhothai historical park, Kamphaeng Phet historical park and Si Satchanalai historical park. 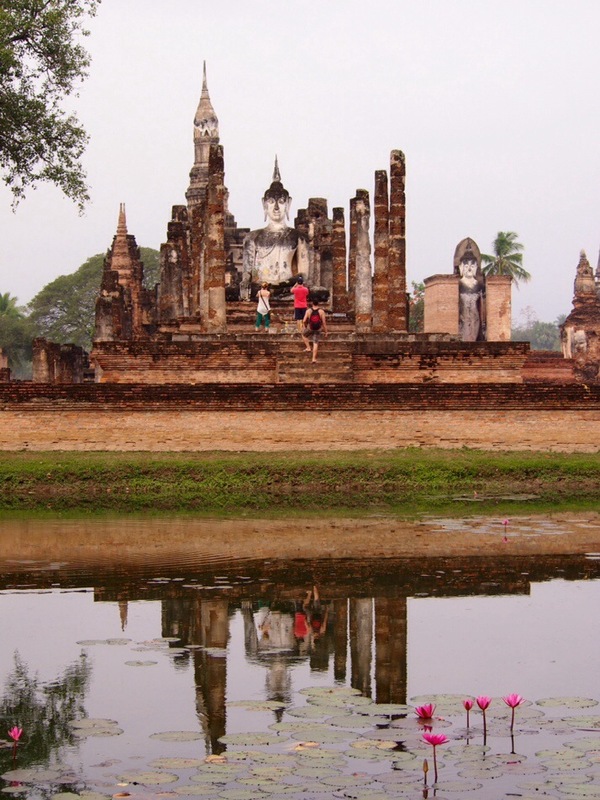 These historical parks preserve the remains of the three main cities of the Sukhothai Kingdom which had flourished during the 13th and 14th century CE. 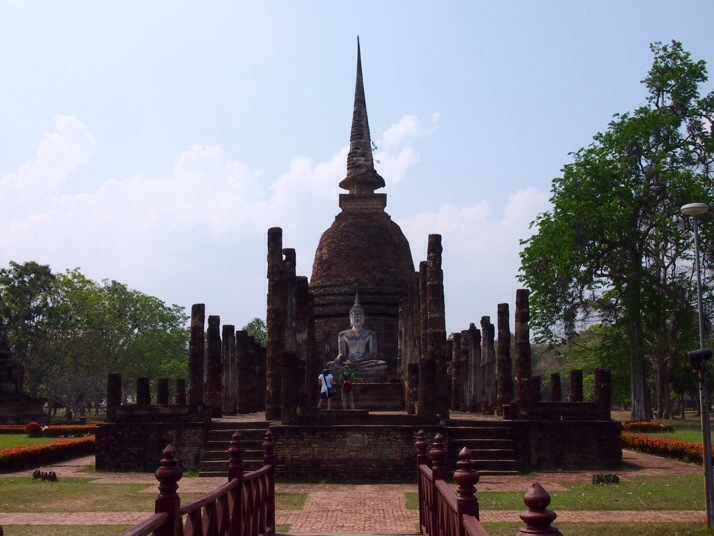 The Sukhothai Kingdom is viewed as having been the first of the Thai kingdoms. 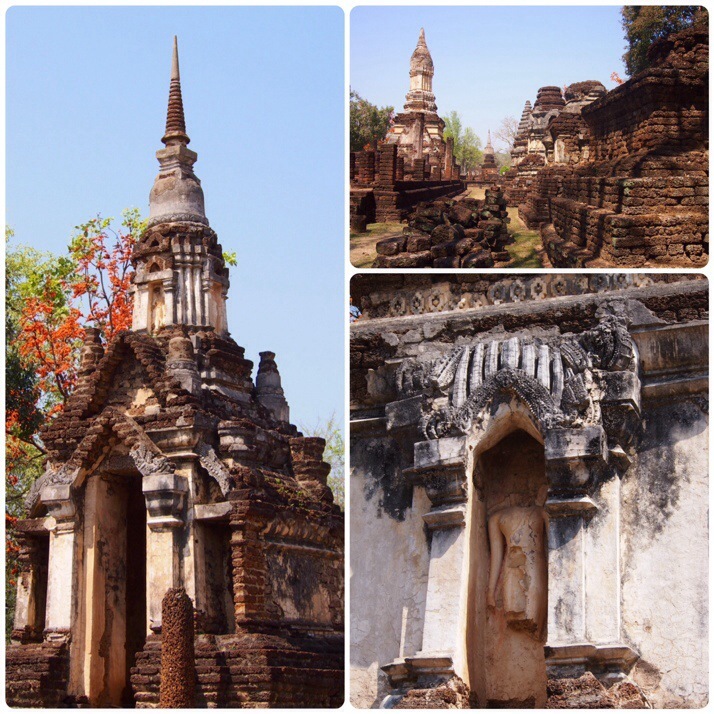 Sukhothai Historical Park is divided into five zones (each with a separate entrance fee). We visited the central area which contains the heart of the old city and the remains of several wats interspersed with pools and surrounded by trees. The wooded park between the wats was a pleasant place to cycle through and even though the bikes that we rented were rather rickety it was completely flat, the paths were in good condition and nothing was very far away. 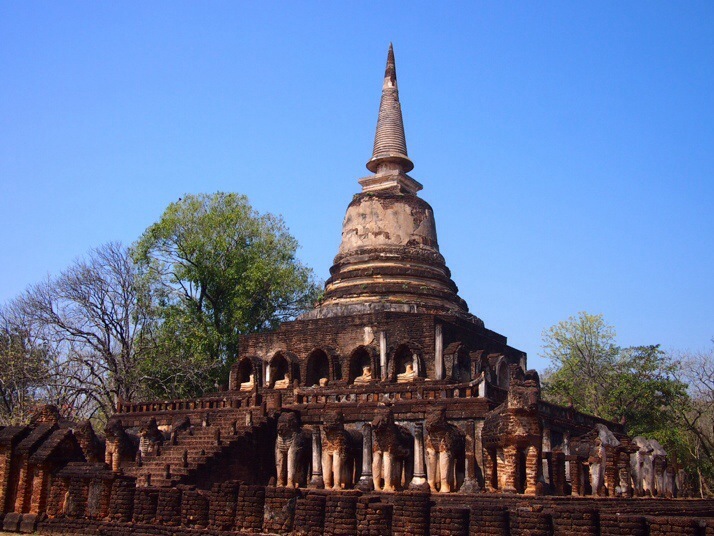 The centrepiece is Wat Mahathat, surrounded by brick walls and a moat it contains a staggering 198 chedis (conical or bell-shaped structures often containing Buddhist relics) as well as the remains of a viharn, or prayer hall, and several Buddha statues. Although somewhat less impressive, many aspects of the site reminded us of the ruins at Angkor in Cambodia and a Khmer influence is obvious in some of the temple domes. Here though there are not nearly as many tourists so we rarely had to wait very long to get a photo with no one else in it, or to get a closer look at something that interested us. 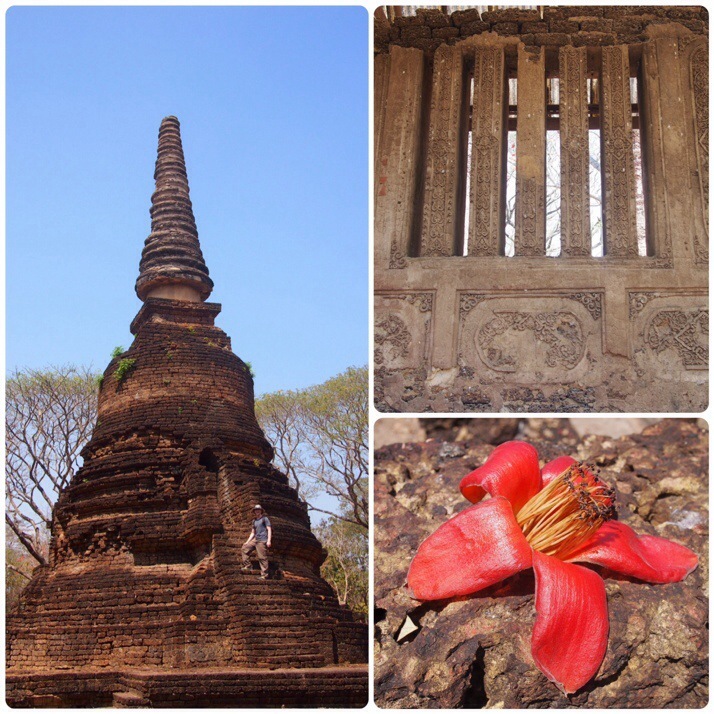 The chedis are of various shapes including Khmer (Cambodian) and Sinhalese (Sri Lankan) influence, but the lotus bud shape is known as typically Sukhothai in style. 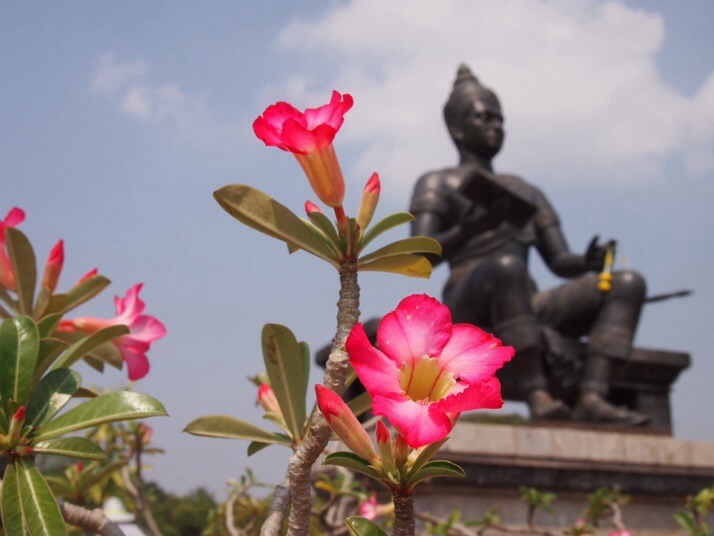 King Ramkhaeng the Great is the best known of the kings who ruled from Sukhothai and he is commemorated here with a monument and several bas reliefs showing key moments of his rule, most notably the carving of the earliest known example of the Thai alphabet. 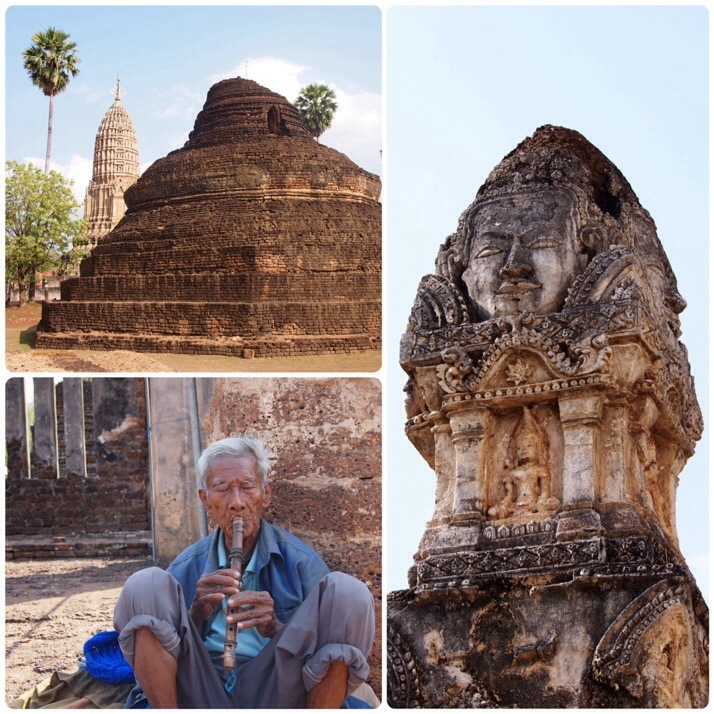 The next day, on the recommendation of our guesthouse landlady, we decided to head off to another of the ruined cities in the same UNESCO listing, Si Satchanalai, about 70km (45miles) north of New Sukhothai. We rented a motorbike and set off through the countryside passing fields full of marigolds and what we think was tobacco (we saw racks of the leaves drying as well as fields full of the plants). 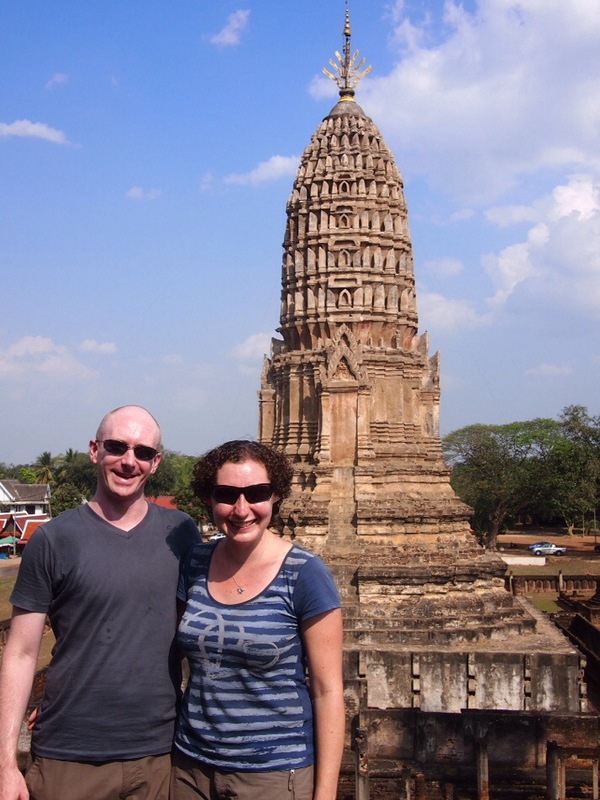 In the morning we explored the main area of ruins and enjoyed them even more than the ruins at Sukhothai. There were even fewer tourists and no traffic noise so that at times we were completely alone in a ruined wat with just the sound of bird song which made it seem as if we were discovering the ancient city before anyone else. The temples were also very varied and, perhaps because of the lower numbers of tourists, more accessible, it’s possible to climb some of the chedis here and have a look inside! 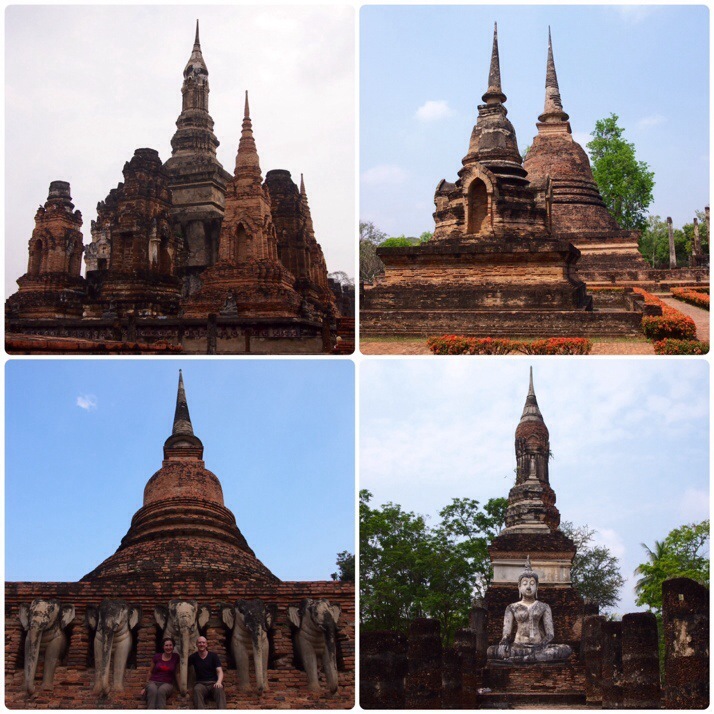 Chedis supported by elephants were a common motif in the Sukhothai period and there’s one at Si Satchanalai too. The elephant’s strength signifies the Buddhist religion being held up for 500 years. This one is much bigger than the one we saw at the Sukhothai Historical Park and has not been restored so you can see the elephants in various states of decay which meant we could try to work out how they were put together. Sadly none of the trunks remain which gives some of the statues quite a menacing look. After lunch in one of the local restaurants outside the park’s gate, we motored 5km down the riverside to Wat Phra Si Rattana Mahathat Chaliang. The entrance gate here has Bayon style carvings of faces and the main shrine itself is also reminiscent of other Khmer architecture which we saw at Angkor. Unlike the other ruins this shrine is still an active place of worship and a working temple is found just outside the ancient walls. 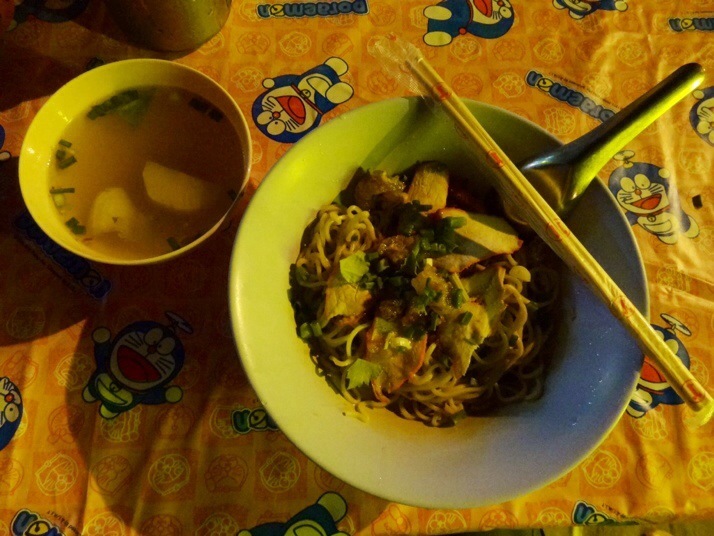 After the long ride back to New Sukhothai we found a street restaurant serving the local specialty, Sukhothai-style noodles with sliced pork, crackling, peanuts, greens and a side bowl of broth. Yum. 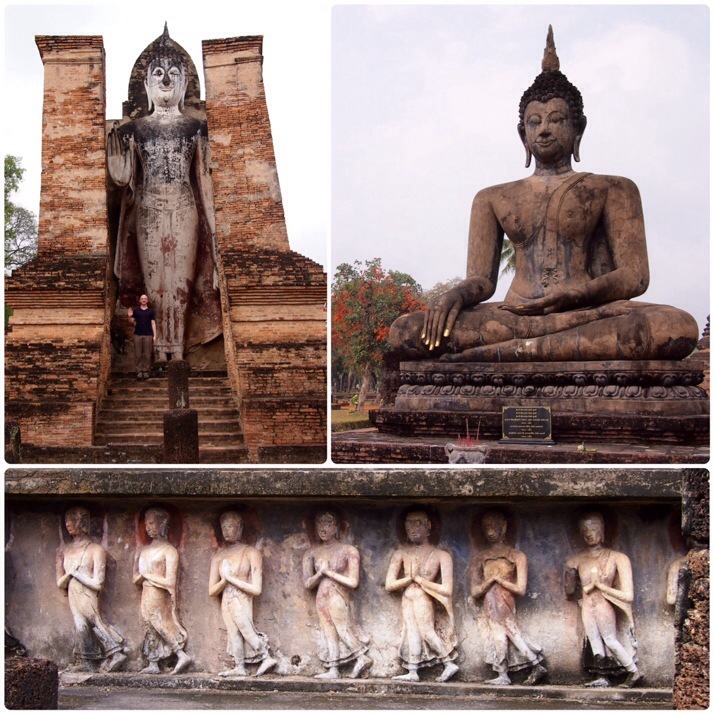 This entry was posted in Places and tagged Si Satchanalai, Sukhothai, temple, Thailand on March 9, 2014 by Julie. So not bored of temples yet? Thanks for leaving us a comment Gonzalo, and for the link to your stunning photographs – they’re beautiful! What is 16 + 30 ?